The CH6000 is a solid state, remote programmable, digital announcer with pass through ability that answers up to 3 lines. It can be used simultaneously for information on hold. Multiple Lines: Answers 1 - 3 lines simultaneously and each line can be turned on/off separately to allow calls to pass through. All lines may have the same message or each a different message. All messages can be down-loaded with one call. Each line can be set separately to answer on 1 to 9 rings. In the ring through mode, the caller hears on-hold programming while the phone is ringing through to the user. Also, the handler message can be repeated and a time interval set between repeats. The Call Handler allows special phone company services, such as caller ID. Call Forwarding: In night answer mode, line 1 can be set separately to forward calls to another line. Line 1 routes them out through line 2. Built-in On-Hold: Equipped with a built-in on-hold capability. The on hold message can be recorded locally or remotely during the same call that other messages are recorded. On hold shares the nonvolatile flash memory with the Handler messages and night answer messages. The on hold message can also be output to the on hold port of the telephone system. Night Answer: Can be programmed for night answer with 24 hour clock. In night answer the unit answers the call, plays a night answer message, and hangs up, or forwards the call as programmed. Auto Pass Through: In the event of a power failure, the unit automatically takes itself off line so calls can be answered without interference. Auto Connect: Anytime a line is not occupied with an incoming call, users may call out. Unit automatically removes itself from the line. Auto Hang-up Detect: Anytime a caller hangs up before the call is answered by user, the unit detects the hang-up and instantly resets for the next call. Zero Gap: When recording a production, the unit records the silence at the start and end of recording. However, the on board computer has the intelligence to go back and delete the silence leaving zero gap in the loop. Call Counter: Each line has 3 counters that can count up to 99,999 calls and can be retrieved either locally or remotely. Volume Control: Unit has a volume control that can be changed remotely or locally. Local control of the volume can be deactivated. Plug and Play: Dealer can preload the unit with messages in flash memory and ship the unit ready to plug and play. Assists with remote loading and retrieving call counts. There is a dealer-definable 5 digit security code with"three times your out" software to prevent unauthorized entry. Code is held permanently in flash memory. In the event of a brownout, a drop in the power will not damage electronics or cause improper operation. Also, recordings in flash memory are unaffected by brownouts. The Call Handler can answer up to 3 telephone lines and give a pre-answer message. At the end of the message, the Call Handler will ring through to the telephone/telephone system. During the ring time the unit has the ability to play on hold programming. Most businesses can use it to pre-condition callers buying thoughts. Flash memory and 64K sampling makes this an excellent multiple port digital announcer with endless uses. (ACD/UCD) Announcements - Movie Theatres - Information Lines -Weather Lines. 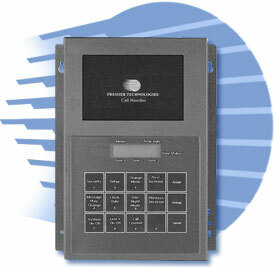 The Call Handler has a clock built in, so it can automatically go into night answer mode at a preprogrammed time. In night answer mode the unit answers the call, plays a night message and hangs up or forwards the call as programmed. In applications where a business receives multiple calls requesting routine information, the Call Handler can be used to give callers this information. This reduces the number of routine information calls employees have to answer.